Tonight! Taking DH Off Campus at the UnLab! 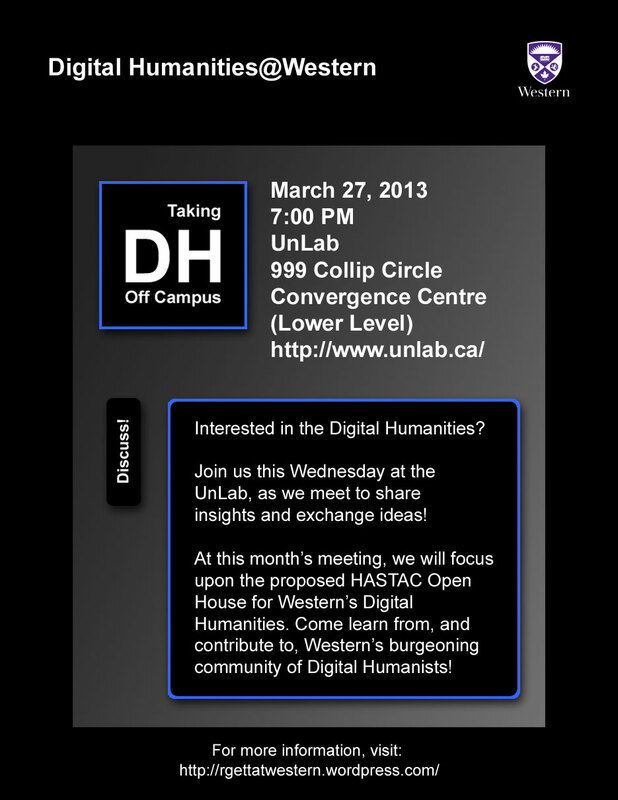 You are invited to join us tomorrow evening at 7pm at UnLab for an informal chat about all things digital humanities. If you are curious about DH and want to know more, if you have ideas for DH related projects, of if you simply want to listen, check out the UnLab, and be inspired, please join us! Discussion is always open and takes many directions. Tomorrow we need to gather ideas on how to showcase Western’s DH classes/projects to the larger HASTAC community, and also ponder what type of DH projects can be done during a 14 hour bus ride! Curious? Come and find out! With thanks to Kim Martin and Devon Elliott! 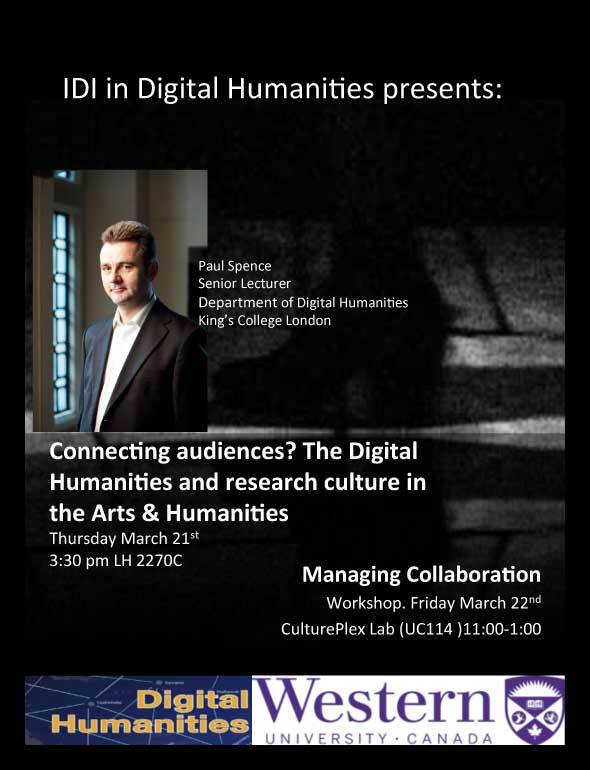 The IDI in Digital Humanities Speakers Series concludes for this year with a presentation on Thursday by Paul Spence (King’s College London)! While digital tools and methodologies are undoubtedly having a transformative effect on many areas of academia, their impact on research culture in the Arts and Humanities has been less assured. Ambitious visions of interconnected scholarly communities are yet to materialise, and in spite of substantial progress on the tools and standards needed to facilitate dialogue and interoperability, it is not clear that humanities scholarship has become significantly more ‘connected’ as a result of the digital ‘turn’. The recently completed ‘Out of the Wings’ research project (http://www.outofthewings.org/), funded by the Arts and Humanities Research Council in the UK, sought to create a collaborative research environment which would bring together theatre practitioners, translators and academics interested in the reception of Spanish language theatre in an English-speaking context. Using the project as a case study, this presentation explores the challenges for the Digital Humanities in connecting audiences, research cultures and data. With thanks (as usual!) to Élika Ortega and Kim Martin!